We've just popped in to wish all of our North American readers a very happy Thanksgiving Day! And of course, best wishes to all around the world celebrating their harvest festivals. wikiHowl gives thanks to good health and the virtual company of our many readers! 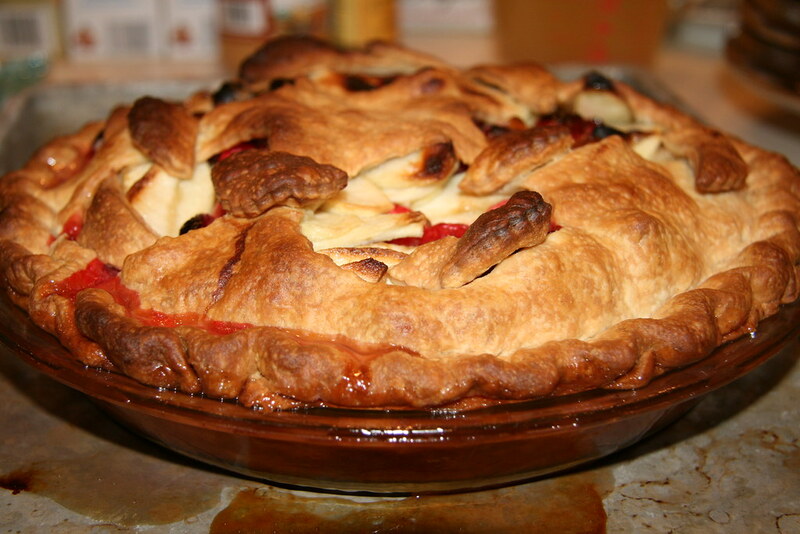 Have a lovely piece of apple-cranberry pie! We have been having a ton of fun on Facebook as we scramble to accept a flurry of friends requests. As continually pointed out by persons unnamed, Facebook is way funner than MySpace. It is great to be able to share our articles over there, and a few pics, too. Getting some feedback from our readers is lovely. Do you think our readers know, Dave, that one of the funnest things we do at wikiHowl is to search for just the perfect photo for each of our new articles? In fact, sometimes we have to delay an article for just a little while, because we really don't know how to illustrate it. Such was the case with today's upload. Thanks for being patient, Dave......that was one of the better articles we had waiting, and we have been sitting on it just a little too long, I know. It took me a while to depict the concept of Orkut, without actually using the logo of the company! But I managed; the young man snoozing on the chair, laptop in hand, has nicely done the trick. Speaking of Orkut.....it's incredibly popular in Brazil, you say. Verdade? Creio que sim! With that kind of popularity, Orkut should not have any trouble staying around for a long time. Bom dia, boa tarde and boa noite to anyone who comes across our Orkut article from that amazing and alluring land to the south. Okay, today is the day that Mashable start the first round of voting in the 2nd Open Web Awards. It is also the day that we found that wikiHowl had failed to get nominated. Are we downhearted? Not one bit, our supporters new and old rallied round and nominated us like crazy nominating machines. It was a great team effort, just not to be this time. Next year we will return like returning things and get that nomination! We're waiting for our I Ran In A Race certificate, and will proudly frame that for pride of place in the wikiHowl penthouse. I think there's a favour we can do for another nominee, wikiHow.com, who were successful (congratulations) in their Wiki category. Take your vote for us and give it to wikiHow on this page please. Can we win, KiS? Well, that's a big question, especially as it's only the nominations for entries into the Open Web Awards at the moment. The actual voting, two rounds, will come later. Blimey we WILL have to work for this. I'm not sure whether the schools don't have it right. We could get an award for just signing up, cool. My son used to run in school Sports Day races and came home proudly with his I Have Run In A Race certificates. Were there prizes for winners? Well, we weren't to find out. It turns out he was more of a Runescape athlete. Heck this would have been great in the Olympics, returning Olympians disembarking from their homecoming planes proudly waving their certificates! Wow, how off-topic is this? Ok, wikiHowl are attempting to enter the Mashable Open Web Awards and will be coming to you for votes if our nomination attempt goes well. Are we going to WIN something, Dave? That would be wonderfully sweet. I have never won anything in my life. I never even got to the point where a teacher would read one of my assignments to the rest of the class! I was not a poor student, and yet I was always struggling in school, not struggling to do well, mind you, but struggling to get noticed for doing well. And it never happened! I never got any recognition whatsoever in elementary school or any other school. I also never got any awards just for showing up; I never was commended because it was Monday; I never had to stand up in front of the student body because it was my "turn" to be honored; and I am really glad about that. Had I been recognized for something inconsequential like "being enrolled in the school", I probably would have thought I was SUPER or something nutty like that. LOL. Really, what kid will fall for that? NONE. I am sure that kids today think the overabundance and absurdity of the school award culture is downright pathetic. How can it be that never did a teacher recognize me for the hard work I did, and yet nothing bad happened ever happened as a result? This was in the days before schools were all about building self-esteem (handing out awards and ribbons to everyone for doing, thinking or imagining just about anything.) Yet, I think I kind of came out okay. Strange, don't you think? No one told me every day of my youth that I was a phenomenal, incredible, mind-blowing genius; could this actually be WHY I managed to learn? No one was fawning over me telling me how great I was, so I decided to try to work hard and do well! Anyway, I never got upset with teachers for not understanding that I had a little something on the ball, so I surely never thought to spend my time annoying a teacher or resenting the power structure in the school. At least not on purpose. No, indeed. Instead I kept toiling away and working harder academically, and it seems to have resulted in my knowing a thing or two now. So that can't be all bad. There seems to be some kind of an Evil Education School Cult in this country which penalizes children by telling them they are already great, and making them think there is nothing more to be achieved. This is really lowering the bar and driving things down into the doldrums and making it impossible for children to do well, mostly because these saccharine-smile adults insist on convincing kids that the kids (and every one of them) are God's Gift to Mankind. Are today's students really going to bother working hard and striving, if they are told every day, in every way, that they are "all that" whether they work or not? Methinks not. But such is the sorry state of modern day education in America and that is not the point of this post, which is supposed to be about wikiHowl and awards! Anyway, we could win an award and that makes me happy. Why? Not because I think we will actually will ever win one, but because when there are awards to be won, people who make zany how-to websites like ours probably work harder to fashion them into the best sites possible. And that is good for the vast world of people combing the web looking for intriguing material. Long live awards which are not handed out on a silver platter. And may the best sites win! 2nd Annual Open Web Awards - wikiHowl To Be Nominated? Help your favourite funny how-to site, nominate us now! So, wikiHowl is one year old this week. What a year it has been; frustration, tears, tantrums, chocolate, elation, and more chocolate. We initially came online with three articles, Fight a Unicorn, Sit in a Chair and Rabbit Eating Disorders. These were pre-launch in late October 2007 and set the tone for things to come. Has the time passed quickly? Oh yes, reaching our tenth article (How to Eat a Shoe) seemed to take forever, and now what seems a few months later we are preparing tomorrows How to Behave in Certain Situations at Restaurants which will be number 117! We have made friends along the way, which among many include the fungis at Illogicopedia, our followers at Twitter, and the latest the recent emails swapped with a new reader requiring more information on how to become a vampire, (good luck with that young master Vang). I raise a toast now to all our readers past and future, "So long and thanks for all the fish! ", oh wrong one... "Happy birthday to us, happy birthday to you, may all your dilemmas be solved by wikiHowl!" Cheers! Along with articles on How Long Can You Keep M&Ms in the Freezer? and How to Freeze a Snickers Bar, or How to Preserve Storebought Candy, I think the internet ought to have articles about how to deal with the chocolate addiction you are hiding from your children even as you pilfer their stash while they are away at school, or dutifully completing their homework. Hah! Our readers are to be commended. They are better dads and moms than I!